Make your own chocolate boxes at home that are allergy-safe! 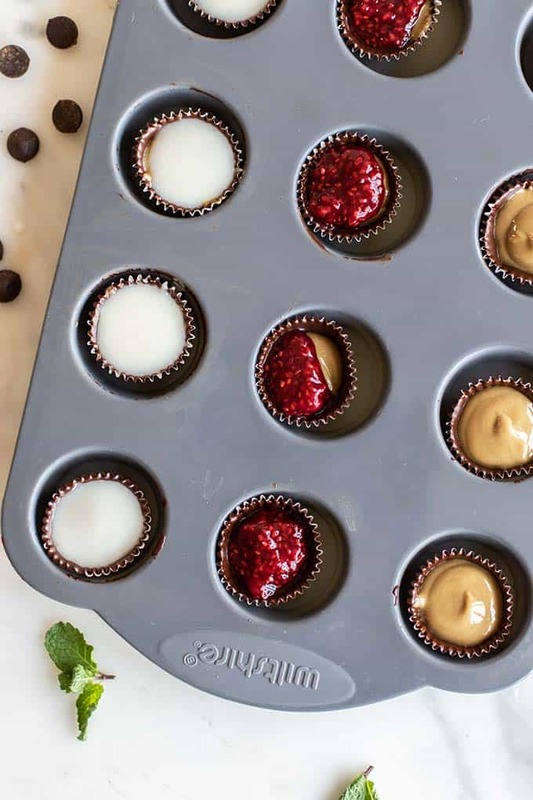 These Dark Chocolate SunButter Cups have a choice of 3 fillings – plain sunflower seed butter cups, or choose a coconut or raspberry jam layer. This post is sponsored by SunButter— makers of my favorite Sunflower Seed Butter. 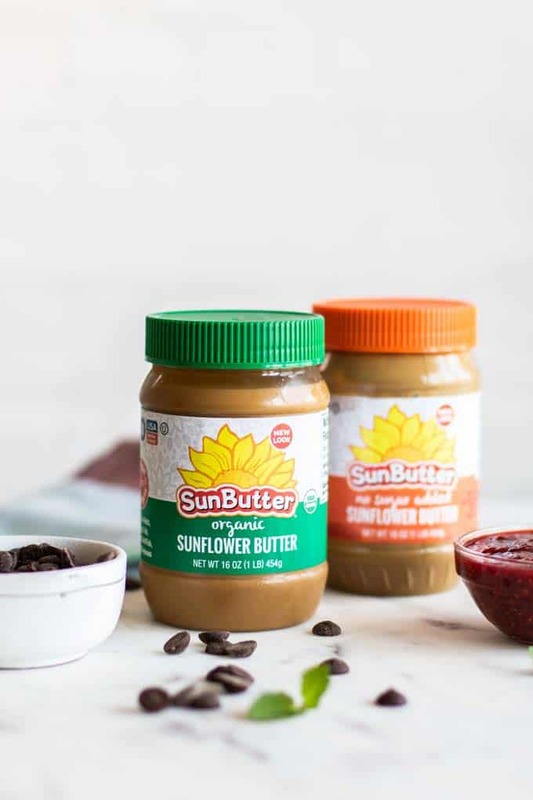 As a peanut allergy sufferer, I value companies like SunButter who create healthy products that are not only delicious, but SAFE! Thank you for supporting the brands that help keep Sunkissed Kitchen running at full speed. Are you a peanut butter cup lover? I have a severe peanut allergy, but growing up, I remember peanut butter cups being everyone’s favorite. I was jealous! They sounded so delicious, but of course, I had no idea what I was missing. 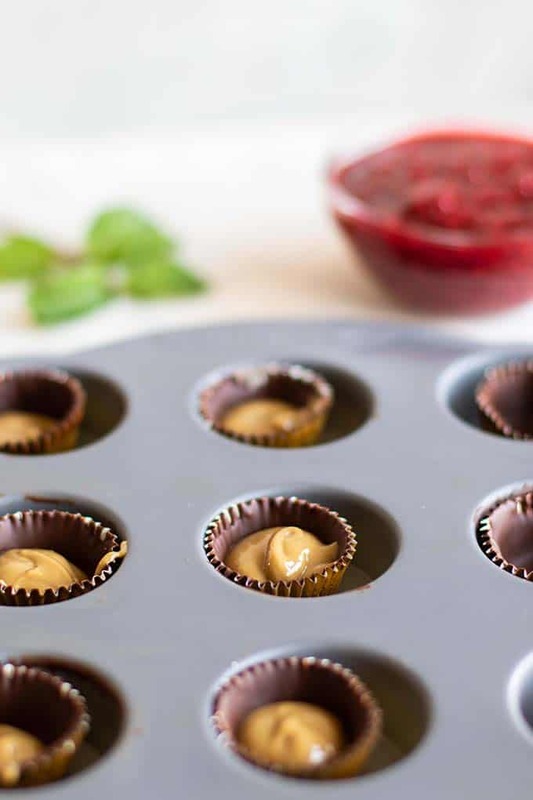 Peanut allergy or not, you aren’t going to way to miss these fun, homemade SunButter cups. SunButter is my favorite alternative to peanut butter. I like almond butter as much as the next, but Sunflower Butter? I seriously have to hide the jar in the back of my refrigerator to keep the spoon from diving in several times a day. I love to make homemade boxes of treats for Valentine’s Day. I get to choose healthier ingredients, and wrap them up beautifully, and homemade tends to go a long way! I like to use little foil wrappers with a crinkled edge because they look pro, make cleaning up easy, and peel off easily. You can find similar foil wrappers on Amazon. I pop them into a mini muffin tin to help them keep their shape. Melt your dark chocolate (I use soy free 69% dark chocolate from Enjoy Life, also an allergy friendly company), and then drop a little chocolate into each one. Using a spoon or your finger, gently cover the inside of the whole liner with chocolate in a thin layer, and then pop in the freezer to harden. This only takes 10 minutes. Once they are frozen, it’s time for the filling! The SunButter layer is lightly sweetened with date syrup, and then gets a thicker consistency from adding coconut oil and coconut flour. I use the No Sugar Added variety. You can also use the organic variety, but you’ll want to add a pinch of salt since it was pure sunflower seeds. We’re going for that chocolate / sweet and salty combo that’s to die for! Don’t know where to buy SunButter? Stores similar to Whole Foods typically carry it, but I order it on Amazon — free shipping with Prime! 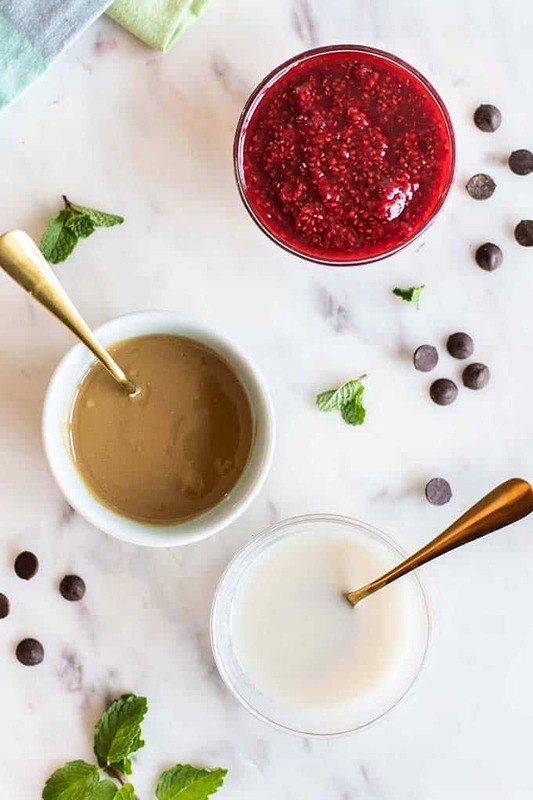 I used a homemade raspberry chia jam for the SB&J version — but use any jam you love! The coconut layer is coconut butter and white honey. Feel free to use any liquid sweetener of choice — I chose white honey because I had it on hand, and I knew I would get a bright white filling. These chocolates are perfect to stash in the freezer for afternoon chocolate emergencies (a true crisis!). 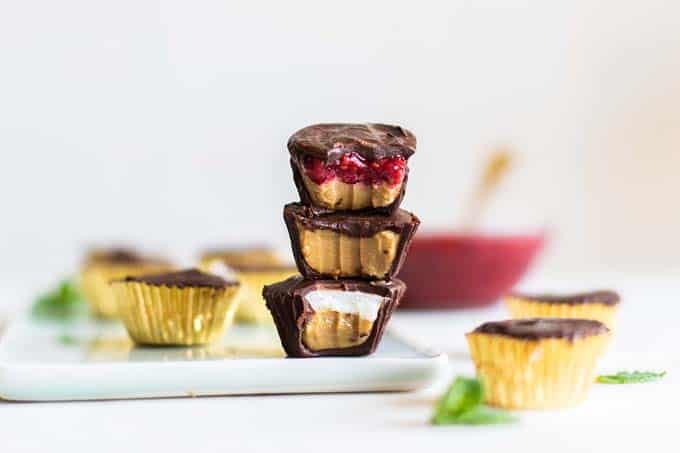 SunButter Cups are also a great treat in your child’s lunchbox, since most schools no longer allow nuts and these are peanut and tree nut free! Don’t restrict these to February — a perfect treat year round! 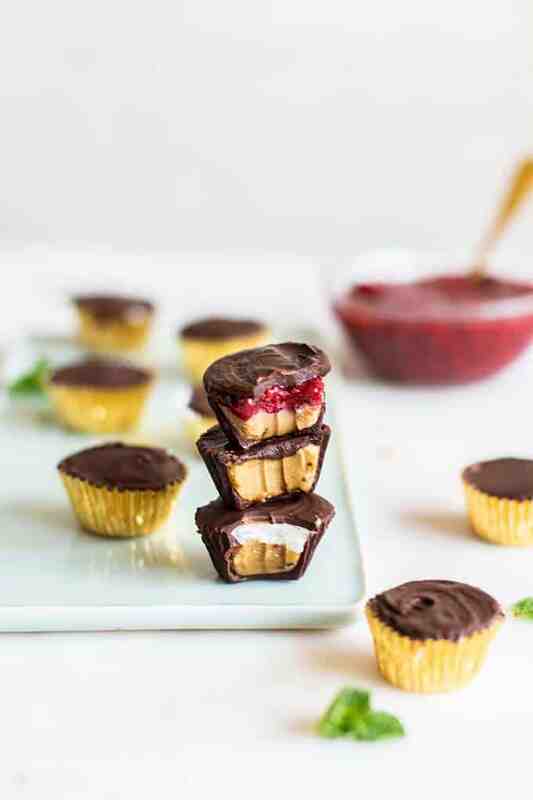 Dark chocolate sunflower seed butter cups are made more fun with the additions of raspberry and coconut layers. Use 12 foil candy wrappers, and place them in a mini muffin tin to help them hold shape. Melt dark chocolate 20-30 seconds at a time, stirring in between to keep from burning, in the microwave. Alternatively, melt on the stovetop with a double boiler. Add a small amount of dark chocolate to each liner, and using a spoon or your finger, spread the chocolate to fill the inside of the cup, up the sides. Freeze for 10 minutes while preparing the fillings. For the SunButter layer, combine all ingredients and mix well. For the coconut layer, combine coconut butter and white honey to keep a pure white look. Use date syrup or maple syrup if you have that on hand, but the color will dark slightly. To 8 of the chocolate cups, fill halfway with the SunButter mixture. Fill 4 to the top with SunButter. To 4 of the chocolate cups, fill the other half with raspberry jam. Fill 4 the rest of the way up with the coconut filling. Top all fillings with another layer of chocolate. I found this easiest if I allowed them to freeze about 15 minutes before adding the top layer of chocolate. *If using the Organic variety of SunButter, add 1/8 teaspoon of sea salt, since this variety is pure sunflower seeds. The No Sugar Added variety has just the right amount of salt as-is. 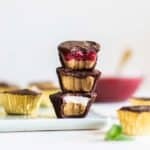 This Dark Chocolate SunButter Cups Recipe post may contain affiliate links, meaning if you make a purchase, I will receive part of the sale as a commission. This helps me continue to bring you lots of fresh and inspired recipes! 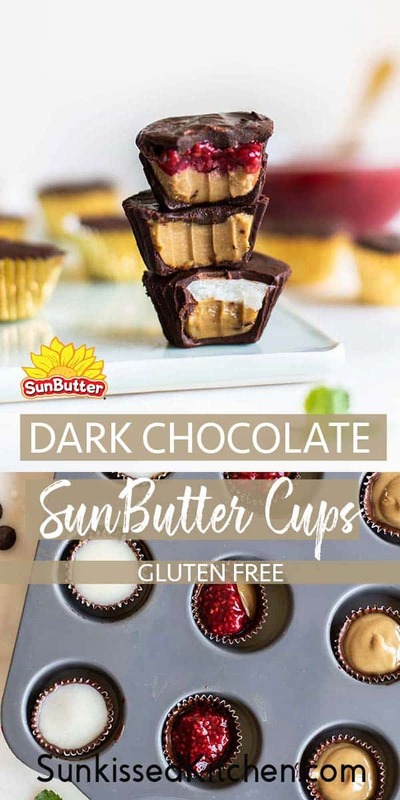 These SunButter cups look so amazing! Yum! Anything SunButter doesn't last long in my house! These will be perfect for my daughter's school where so many things are off limits! Can't wait! Perfect for a school setting! I really appreciate the effort schools and parents are making now to make food safe -- my peanut allergy meant I was always excluded as a kid! These look amazing!!! I'm excited to try all these variations! This is a genius way to use the sunbutter! 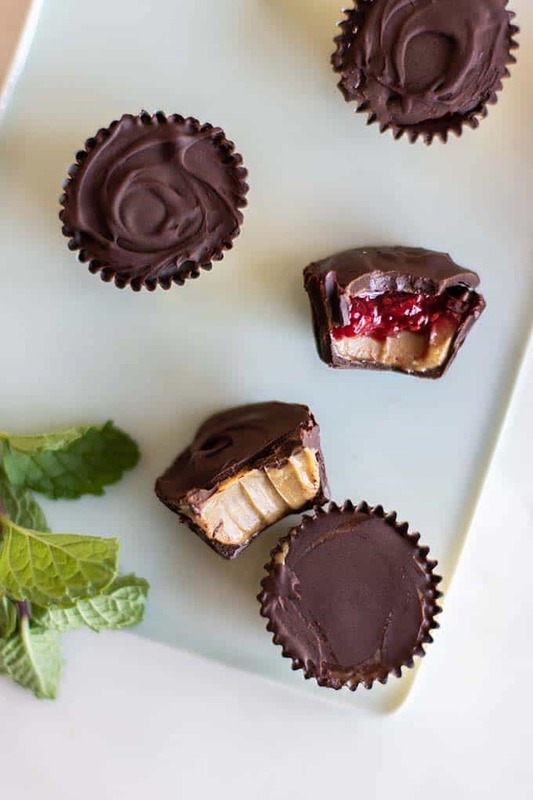 Love peanut butter cups, but now I need to try your vegan version and the combinations. SOund like a perfect little treat.